The Martin Fog Glaciator X-Stream from Jem brings you a total, ground fog effect solution in a self-contained unit. Dispensing with the cost and logistical mess of Dry Ice and CO2, the Martin Fog Glaciator X-Stream utilizes the simple but immensely effective Jem heavy fog fluids and a radically advanced, closed loop refrigeration system; bringing you an all terrain, all applicable heavy fog solution. The Martin Fog Glaciator X-Stream houses a remarkably powerful compressor, allowing colossal fog output levels. And because of its advanced, electronically controlled expansion valve, it has a rapid freeze down time and a fast recovery when fired. 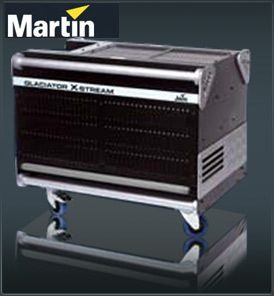 This means the Martin Fog Glaciator X-Stream runs continuously, - almost infinitely, with a cool ease. Its chassis design; with two high velocity fans and smart-flow ventilation, also keeps the Martin Fog Glaciator X-Stream ticking in environments of high ambient temperatures. And keeping an eye on internal components is done with an unparalleled simplicity using the Martin Fog Glaciator X-Stream’s Internal Diagnostic Assistance. Featuring a Power Save System when passive, The Martin Fog Glaciator X-Stream is conscientiously efficient with energy and sound, and its cooling fans have a low noise operation when idle, benefiting theatrical and Studio applications. Where silence is golden and space is rare, the Martin Fog Glaciator X-Stream’s remote ducting system allows you to place the unit up to 10 meters away from its application area. A great solution, the remote access system does not in any way compromise the Martin Glaciator’s X-Stream fog output density!